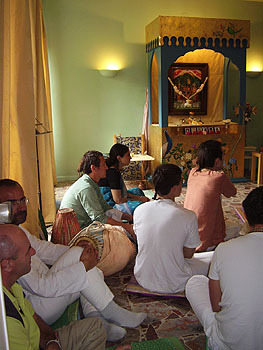 Sunday morning began much the same as every other day during this week, with an early rise for Mangala Arati and class. 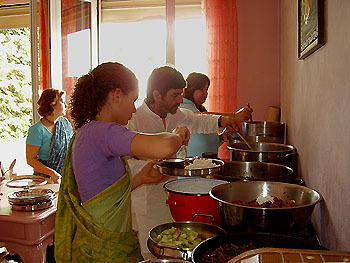 Immediately after breakfast prasadam, preparations for the Sunday noon feast were under way. To the sadness of the devotees, some already began their homeward journey, back to the places were they live their daily lives; quite a contrast to the homeward journey back to Godhead that we had been experiencing together over the last few days. ...and asked questions which he answered, always referring to the Scriptures and referring to what he has heard directly from Srila Gurudev and Srila Guru Maharaj. 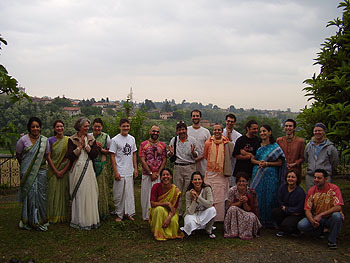 The feast was a huge success, with several guests showing up for the first time, as a result of the recent exposure due to Sripad Goswami Maharaj's visit and the presentation of the Italian Bhagavad Gita. It was a substantially large gathering with about fifty people present altogether. 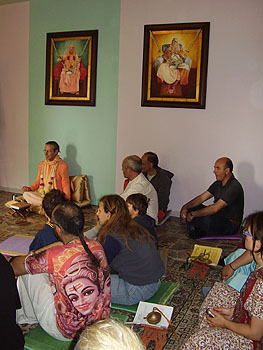 Sung bhajans were followed by another nectarean class by Sripad Goswami Maharaj, who then answered questions asked by the visitors and the devotees. 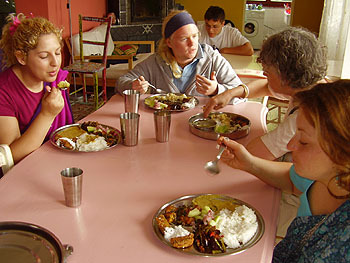 After arati, an opulent prasadam feast was honoured, with both the prasadam room and the outdoor tables full of people, and just as the devotees were about to relax a little after the meal, a suggestion for a daytrip for the devotees with Maharaj was suggested. ...which everyone honoured and appreciated. 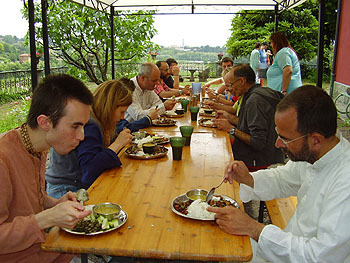 Several devotees and guests sat outside, making the most of a beautiful day! After prasadam many guests lingered on, associating with the devotees and expressing their curiosity and interest in Krishna consciousness. A group photo was taken on the spur of the moment, so several of those present did not make it into this picture!